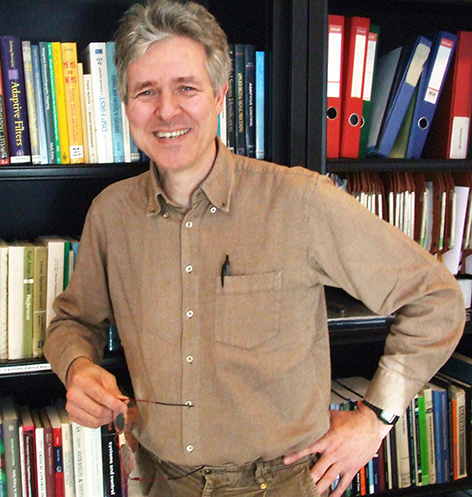 Michel Verhaegen received an engineering degree in aeronautics from the Delft University of Technology, Delft, The Netherlands, in 1982 and the doctoral degree in applied sciences from the Catholic University Leuven, Belgium, in 1985. During his graduate study, he held a research assistantship sponsored by the Flemish Institute for scientific research (IWT). From 1985 to 1994, he was a Research Fellow of the U.S. National Research Council (NRC), affiliated with the NASA Ames Research Center in California, and of the Dutch Academy of Arts and Sciences, affiliated with the Network Theory Group of the Delft University of Technology. From 1994 to 1999, he was an Associate Professor of the Control Laboratory, Delft University of Technology and was appointed as Full Professor with the Faculty of Applied Physics, University of Twente, The Netherlands, in 1999. In 2001, he moved back to the University of Delft and is now a member of the Delft Center for Systems and Control. He has held short sabbatical leaves at the University of Uppsala, McGill, Lund, and the German Aerospace Research Center (DLR) in Munich and is participating in several European Research Networks. His main research interest is the interdisciplinary domain of numerical algebra and system theory. In this field he has published over 100 papers. Current activities focus on the transfer of knowledge about new identification, fault tolerant control and data-driven controller design methodologies to industry. Application areas include smart structures, adaptive optics, and wind energy.